we are in the depths of winter again. Amid nature's overwhelming detail, I like to find a simple abstract composition. This capture fits the bill. If you're looking for color, today I am contributing to The Inspiration Studio with a vibrant photo of my ribbon work. It is our second week exploring the theme of color. Enjoy! Yes snow is a reality during March and even April here. I also remember 4 inches of snow May 1st several years ago :-) Beautiful capture. Beautiful photo, even if I'm so sick of snow, you somehow make it look amazing! Even though I don't want any more snow. We are covered once again, and I'd already raked and everything. What caught my eye first on this photo was the void between the main trees - gorgeous photo that has so much depth. 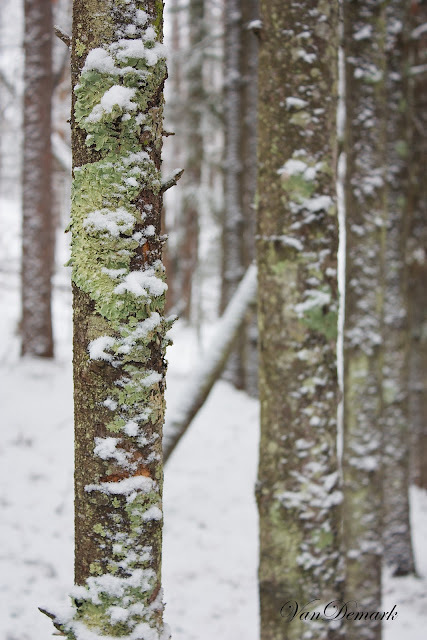 pretty much the perfect combination of lichen and snow.